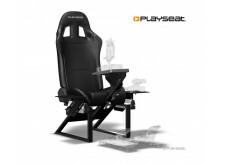 Feel the thrill of piloting a war plane through intense air battles or safely landing a Boeing 747 at home with a Playseat® Air Force flight simulator setup! This flight seat has an extra strong, lightweight, powder coated tubular steel frame with high-tension spring and wire system for the most intense flights. The high profile side bolsters are made of ultra high-density foam; fully upholstered synthetic leather, with reinforcements in the high wearing areas. Superior build quality, stability and comfort make sure you can enjoy this chair for many years. For the ultimate flight simulation experience, combine the Playseat® Air Force flight simulator with the flight simulator controls of your liking.